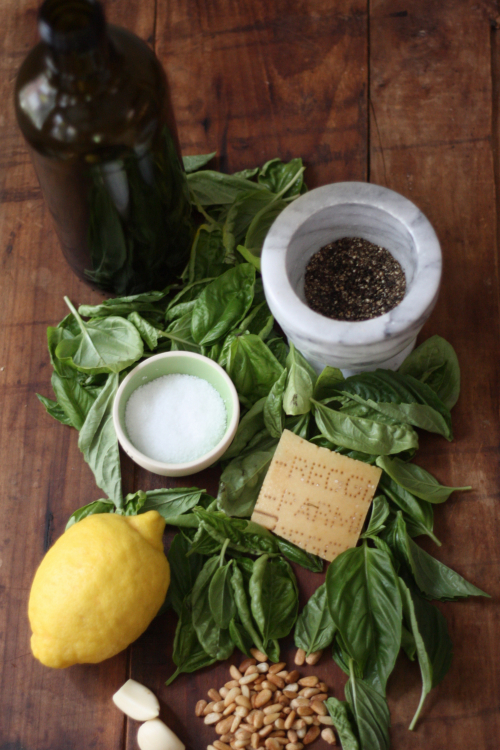 I made a simple pesto with the all of the usual suspects for my latest post over on Aftertaste by Lot18. Pesto can be so easy to make from scratch and is such a versatile ingredient that can be incorporated into dishes as a flavorful addition. This particular pesto included basil from my own urban garden, which this time of year is the perfect time to be pinching it back in order to encourage one more spurt of growth before the season ends. Find the full recipe for this pesto here. I always like to make a little extra pesto when creating from scratch so I have leftovers for use in future dishes. 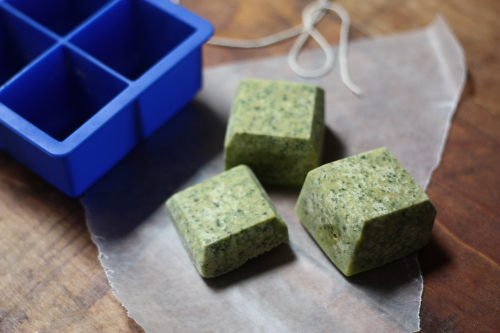 Today I thought I'd show a unique way to preserve your pesto — did you know you can actually freeze it for use later? 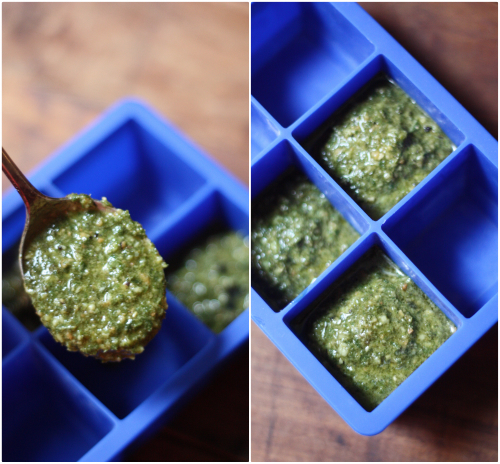 By simply spooning the pesto into individual ice cube tray wells, you can gauge the portion size. Use a full well for a family sized meal or fill a well half full for a single serving size. These king ice cube trays are perfect for the job — I love how they are oversized and can handle a large scoop. Allow them to freeze overnight and you can simply pop them out proportionally to the dish you are going to make. Seal in an airtight container or zipper bag in the freezer to store. When ready to use, place them in a small bowl and allow to come back down to room temperature while you're prepping and cooking the meal. 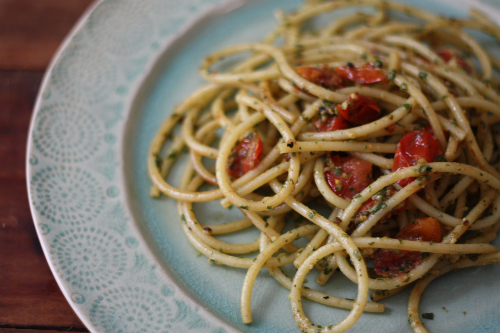 The dish I created with this round of pesto was a simple blistered cherry tomatoes with fresh basil pesto and bucatini! Such a simple light summer pasta using ingredients that are so seasonal right now. What's your favorite method for preserving the fresh flavors of summer? Just beautiful and so practical! 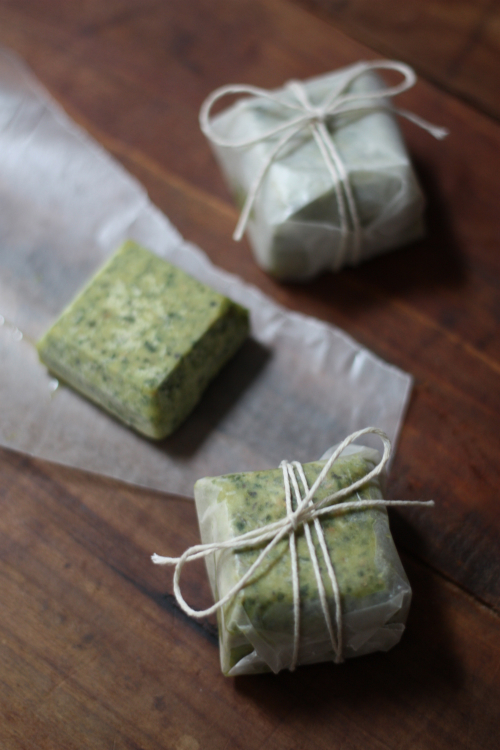 love that wax paper wrap and the twine, very elegant too. Pesto! Beautiful and delicious looking I might add! I always use walnuts instead of pine nuts. 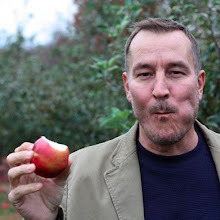 Yes, walnuts are great also! 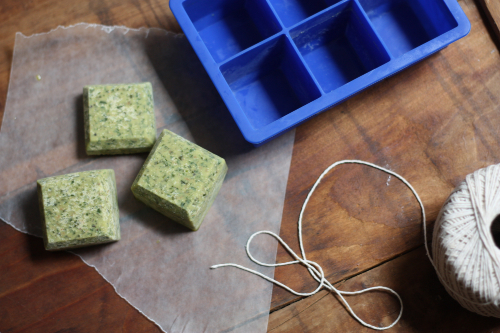 How do you keep the pesto from turning brown when you freeze it? BTW Congrats on becoming full-time. I love both of your blogs! Thank you Melissa, I have never had a problem with the pesto turning brown. Certainly these will not keep forever (month or two). The ones I did for this both are still bright green going on two weeks. Make sure once frozen you wrap them and keep them in storage freezer bags. awesome site and beautiful pictures. You love to cook and are good at it, it is your art!!!!!!! Thank you for the idea.